The invitation-only conference will bring together economists, law scholars, intellectuals, venture capitalists, and businesspeople for two days of discussion. The keynote speakers will be Makan Delrahim, assistant attorney general of the Department of Justice’s Antitrust Division; Alvin Roth, the 2012 Nobel laureate in economics; and Jean Tirole, the 2014 Nobel laureate in economics. 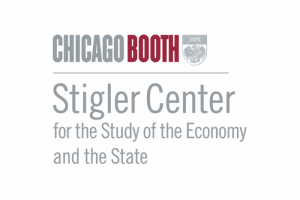 Last year, the Stigler Center brought together dozens of top scholars in law, economics, history, and political science, along with policymakers and journalists, for a three-day conference dedicated to debating whether America had a concentration problem. Among the topics discussed were the empirical evidence on the effects of a reduction in competition, the relation between market power and inequality and the role and scope of antitrust policy in an age of big data and winner-take-all digital platforms. While opinions on the existence and the magnitude of the problem differed, a majority of voices at the conference expressed concern that the permissive antitrust policy started in the early 1980s might have gone too far. This concern was immediately echoed in the media. In fact, since the conference the number of articles in the press decrying a monopoly problem in America has skyrocketed. One of the main area of concerns that emerged at last year’s conference was the dominant position of digital platforms and, more generally, of Big Tech. Once celebrated as brilliant innovators that make the world a better place, during the last year Big Tech has faced a fierce backlash (relabeled “techlash” by The Economist). Facebook is dealing with mounting criticism over the role it played during the 2016 presidential election and its vulnerability to political propagandists, Google has been charged and fined by European antitrust regulators for anti-competitive conduct and is still being investigated, and Amazon is faced with increased scrutiny over its rapid growth and its impact on labor, small businesses, and the economy at large. That 2017 has been a turning point for the public perception of digital platforms seems like an understatement: once a taboo thought, the idea of breaking up Facebook, Google, and Amazon (like the similarly dominant Standard Oil and AT&T before them) is now routinely brought up in the pages of the Wall Street Journal, The Economist, and Esquire. As they continue to grow and spread into new areas, digital platforms are not only transforming communication, media, and retail, but have the potential to disrupt many other industries as well. Is the case for intervention sufficiently strong? Is so, what form this intervention should take: regulation, break-ups, or forced divestments? Alternatively, should digital platforms be forced to open their networks to allow data portability? What are the risks of stymying innovation that these different forms of intervention are likely to produce? In the remaining weeks leading up to the conference ProMarket will publish several contributions of conference participants. These contributions will be collected together in an e-book that will come out shortly before the conference to set the stage for a lively debate at the conference.